This list consists my favorite places to grab vegan food in Istanbul, Turkey! There is so much more to Turkish cuisine then kebabs. 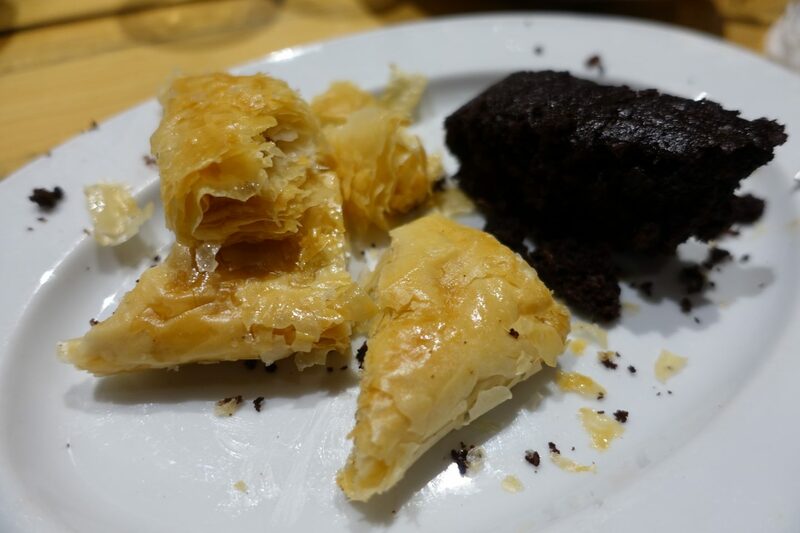 I learned that traditional Turkish food isn’t all about meat and while meat does play a huge role in Turkish cuisine, there are heaps of vegetarian and vegan options. All it takes is a bit of asking and looking around to find out what’s available. Dolma is a family of stuffed vegetable dishes and they are usually all vegan. Try traditionally stuffed wine leaves or stuffed aubergines. Lahmajoun, also known as Turkish pizza is a round, very thin piece of dough topped with minced meat and vegetables. For a vegan version of this dish head to the Community Kitchen. 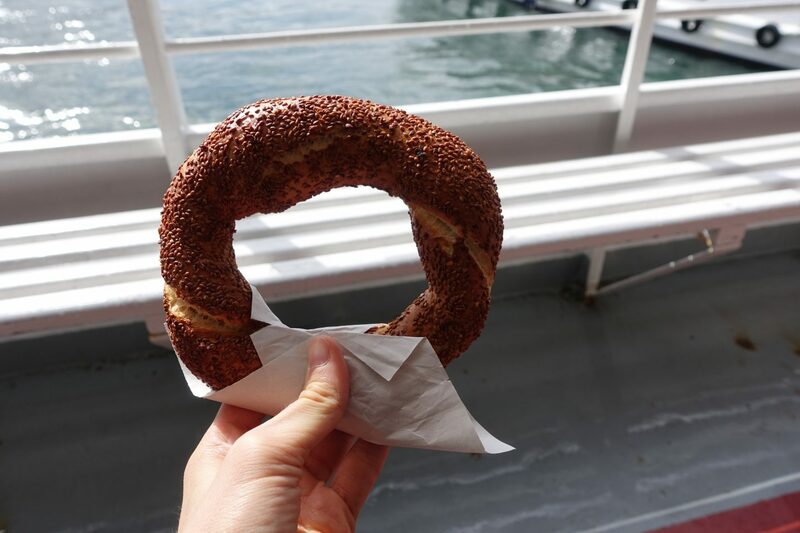 Simit is a circular bread that’s typically encrusted with sesame seeds. It’s the ultimate snack and although it may appear quite plain, it’s incredibly delicious! Simit can be found at most bakeries and at little carts that are lining Istanbul’s streets selling roasted chestnuts, corn and Simit. Çiğ Köfte used to be made of raw meat until this practice was banned in 2009. Today Çiğ Köfte is made from bulgar, spices and lemon juice. It is usually served in a wrap (dürüm) or on a platter. While you can get it at quite a few places, I highly recommend getting it at Çiğköfte M at Caferağa Mahallesi, Moda Cd. 95/C (on Istanbul’s Asian side). It’s a franchise and they have locations all over Europe, and there are heaps of them in Istanbul. Have a look at their store locator here. 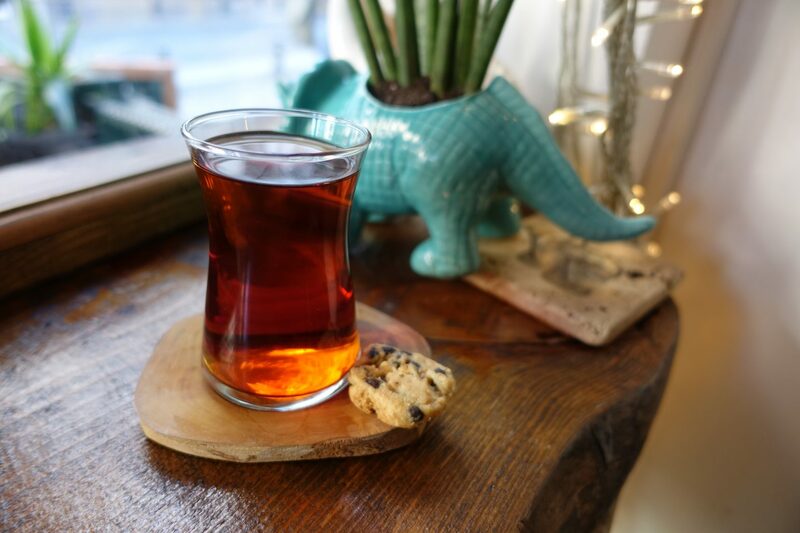 Served in a slim-waisted and curved glass, Turkish tea is usually being served after a meal and is amber-colored and bitter. Turkish tea can be found at literally any place and I highly recommend trying it while in Turkey. I enjoyed mine at Cafe Zoo at Caferağa Mahallesi, Sarraf Ali Sk. No:3, a cafe I highly recommend checking out! 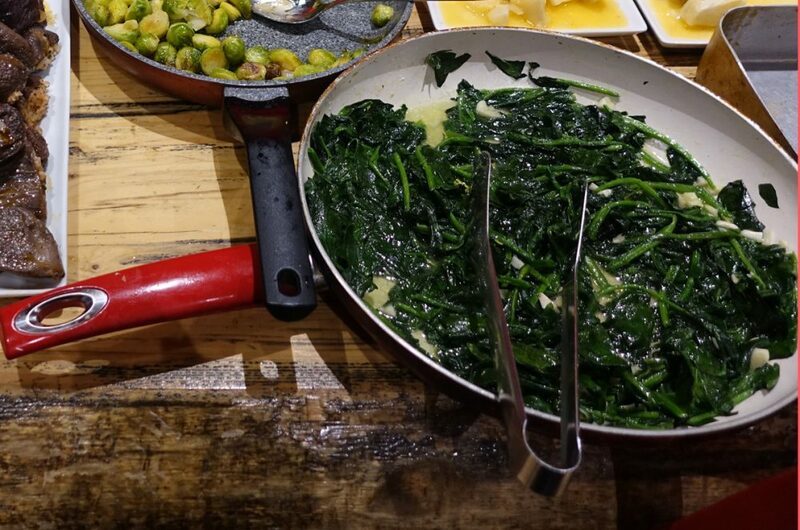 It’s a dish made out of sautéed spinach and simply means “roasted spinach”. It’s absolutely delicious! While it can be vegan, make sure to double check as there can be variations. I enjoyed this dish at Community Kitchen. While falafel is not a traditional Turkish, it is becoming more and more popular and you can see heaps of shops selling it all over Istanbul. 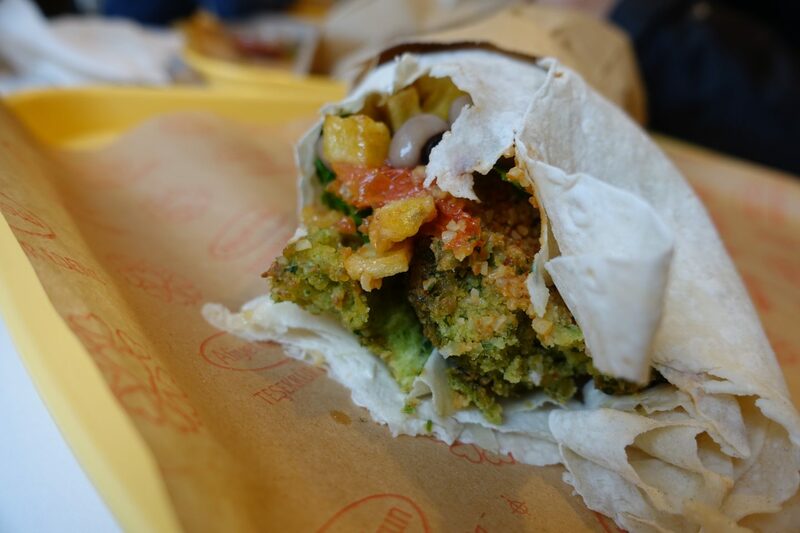 Falafel is usually made out of chickpeas and various spices. It’s delicious and served on either a platter or in a dürüm (wrap). The best falafel I ever had I got at Rulo Lezzetler at Caferağa Mahallesi, Nailbey Sk. No:15. 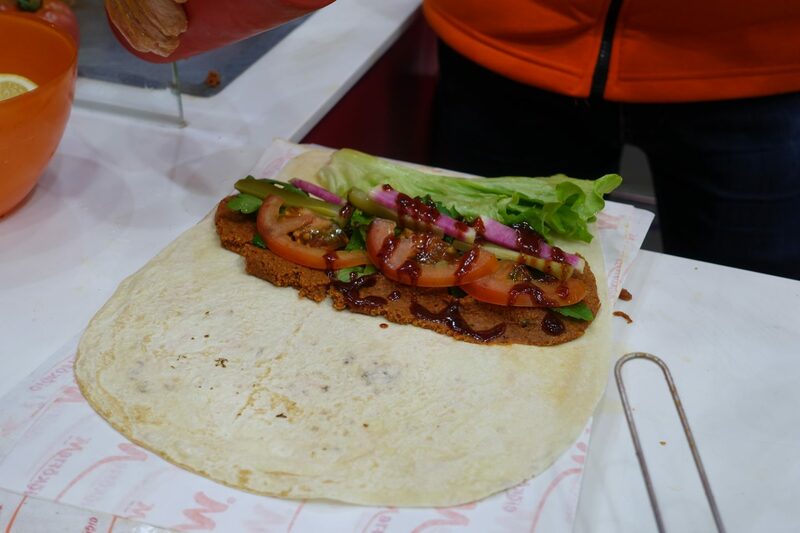 It’s a small vegetarian place that offers falafel for 9 TL and they have the biggest assortment of fillings – think salad, beans, greens and more – I have ever seen. Makarna Sarayi on Mollafenari Mahallesi, Vezirhan Cd. No:18 also has great falafel although there are only a handful of fillings to choose from. We both ordered the falafel (without the yogurt sauce) for 8 TL and it was delicious! Falafel köy is located on the same street as Community Kitchen at Şahkulu Mahallesi, Kumbaracı Ykş. No:69 and their falafel is delicious! Not only do they have basic falafel in a dürüm, they also have an abundance of different plates. They guys working there are also incredibly friendly and I highly recommend popping in for local tips and recommendations! 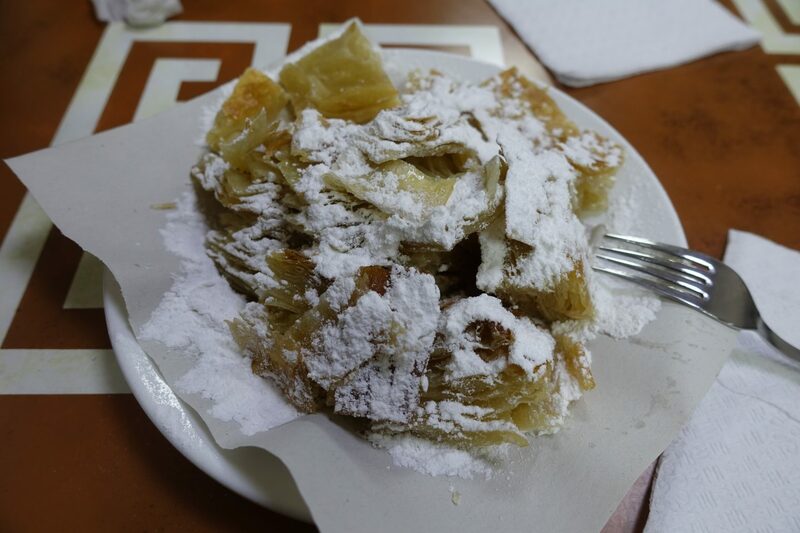 Plain (sade) börek is made of a thin flaky dough known as phyllo and is then oftentimes covered in sugar, which is commonly referred to as “Kürt böreği”. Sade börek is usually vegan, it’s always worth asking though as there can be variations. The Community Kitchen serves incredibly sage tea, it must have been my favorite tea of all-times. It was incredibly delicious! You can find sage tea at pretty much every cafe and if you are a lover of tea, then I highly recommend getting it. Turkish delight or lokum is a sweet made with cornstarch and sugar. 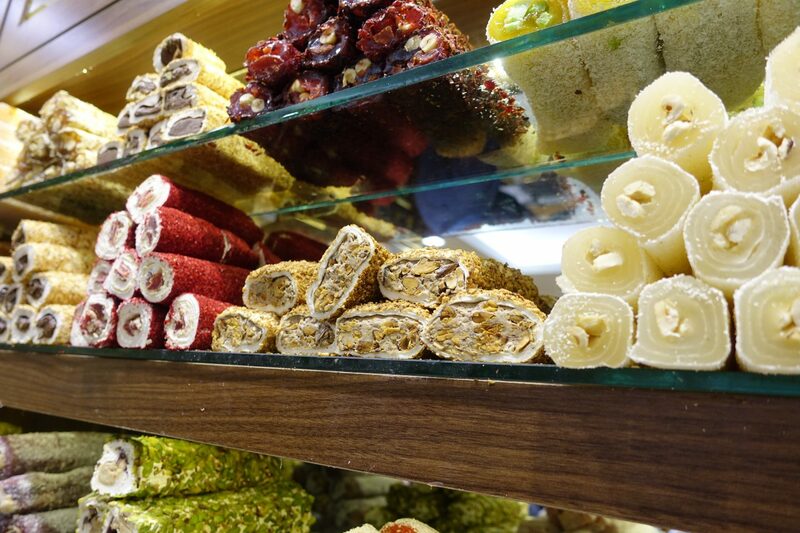 While real lokum is completely vegan, there is a great variety of Turkish delight and I would definitely double check with the shopkeeper to make sure that what you are thinking is vegan, is indeed so. I grabbed fresh and creamy peanut Turkish delight at the Grand Bazaar and absolutely loved it! Baklava is a sweet dessert made of layers of flaky filo pastry, butter, nuts, and honey. While Baklava can be made vegan, it isn’t at most shops. When we first popped into Community Kitchen, we got to sample vegan baklava and it was amazing! If you are a lover of sweets, make sure to pop into Community Kitchen and give it a try. 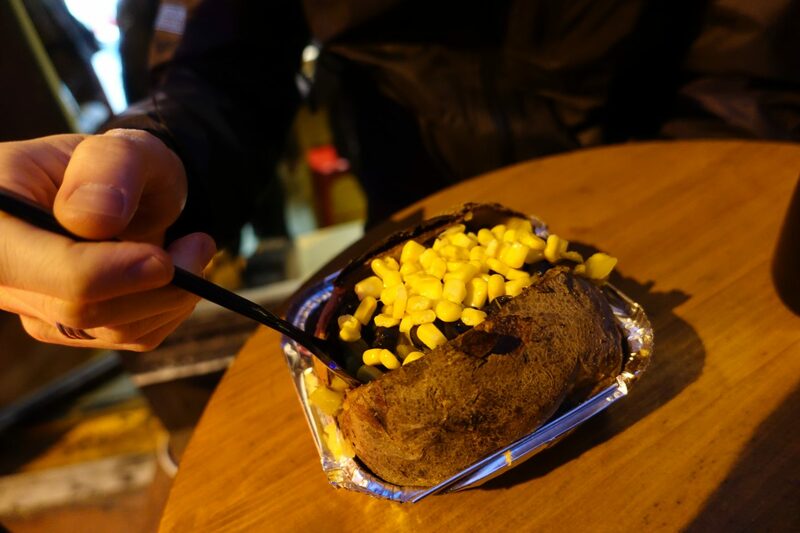 Turkish kumpir (potato) is a potato traditionally baked in the oven, cut open and then mashed with a fork using butter. There are small shops selling it all over Istanbul and we initially struggled to find a vegan one. Luckily, we ended up stumbling upon Taunt Potato Club. 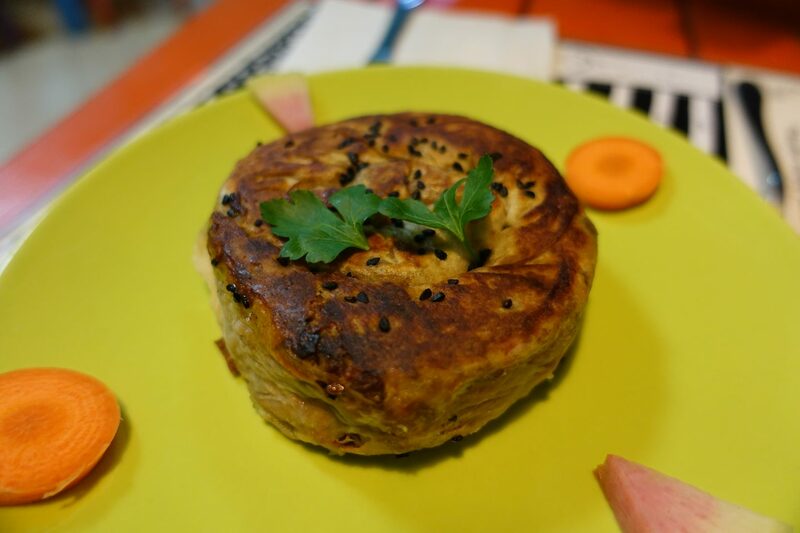 Taunt Potato club specializes in making kumpir and they have one that is 100% vegan for 18 TL. In place of butter, coconut milk is used and it comes with heaps vegetables and sauce on top. We weren’t super hungry and ended up sharing one – it was super delicious! Community Kitchen is a 100% vegan restaurant full of super sweet cats that is open every day except Tuesdays. Don’t let Google trick you into thinking that it is permanently closed – Oya said that she has been in touch with Google on getting this issue resolved. Community kitchen is located at Şahkulu Mahallesi, Kumbaracı Ykş.No:57. Oya, the owner, serves delicious Turkish home cooked meals. The menu consists of Iskender, dried aubergine dolina, stuffed peppers, and heaps more. Oya also offers baklava (it’s the best!) and hemp milk brownies. Hands-down one of the best brownies I’ve ever had, and I had a whole bunch since going vegan in 2015! Every Friday Oya is hosting a private dinner and you get to eat heaps of different foods for 25 TL. 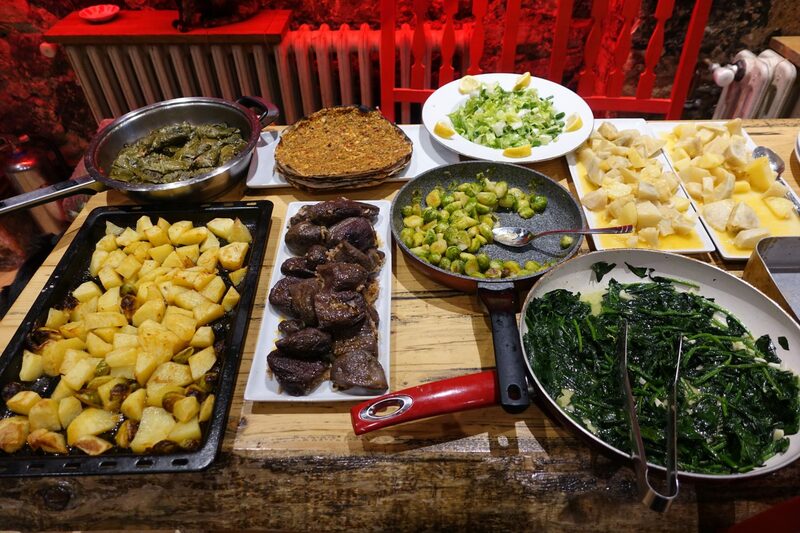 On the photo, you can see Turkish pizza, dried aubergine dolina, potatoes, spinach and heaps more! She also made baklava and her delicious brownies. Make sure to message Oya on Facebook or stop by if you are around to reserve a spot for her Friday dinners! We also ordered sage tea and it’s one of the best teas I ever had. If you love home cooked food in a lovely, cozy and homey environment then Community Kitchen is your place! This little place is such a gem! 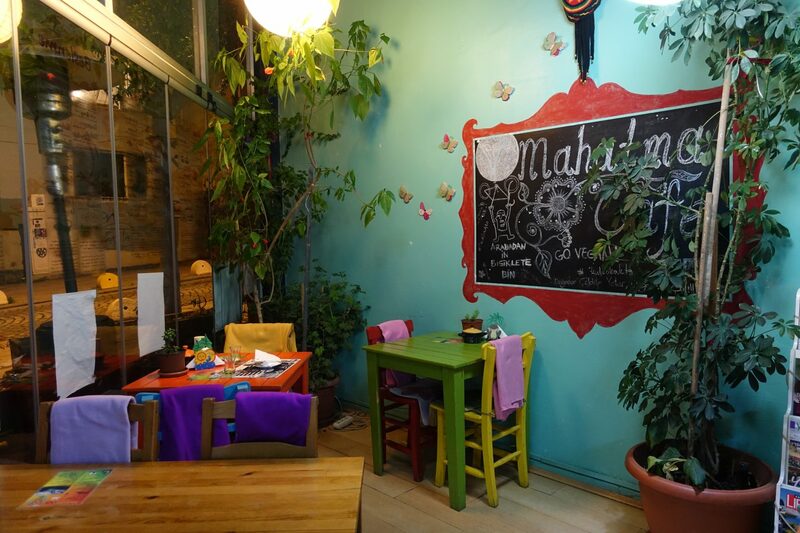 Mahatma Cafe is located at Rasimpaşa Mahallesi, Macit Erbudak Sk. 50/a and they offer fresh, vegan, homemade food. The place is family-run and offers vegan versions of traditional Turkish dishes as well as other foods. We ended up getting a Börek with leek and lentil filling and a cookie for 13 TL. The Börek was one of the best I’ve ever eaten and the cookie was incredibly flavourful. The atmosphere at Mahatma Cafe is really lovely and all the meals are prepared right there in front of your eyes. The owner was incredibly sweet and kind. Upon hearing that my babe was a little and the weather he offered us homemade tea on the house and hooked my babe up with medicine, clove, and VapoRub. We also got to sample their homemade hummus, oh boy was that one good! I mentioned Falafel Koy earlier and this place deserves a big shout-out! It’s located at Şahkulu Mahallesi, Kumbaracı Ykş. No 69 and they over delicious falafel plates, dürüm, hummus and heaps more. They are located on the same street as Community Kitchen and the guys who run the place are super lovely! Drop them a message if you have any questions. If you are looking for delicious and affordable food, check it out. 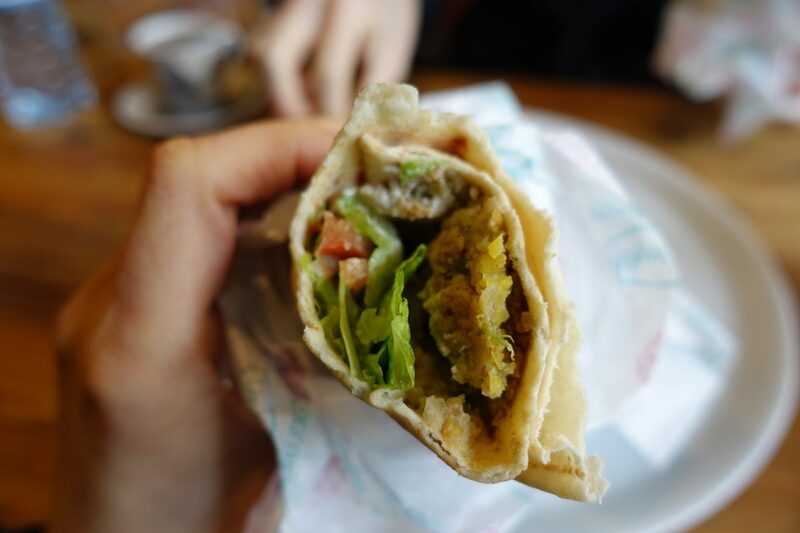 I ordered the falafel dürüm for 7 TL and loved it! Migros is a supermarket chain with a handful of shops in Istanbul. MM Migros, a huge supermarket at Ömer Avni Mh., Sinan Paşa Köprü Sk. No:14 has, among vegan specialty items (tofu, plant-based milk, etc. 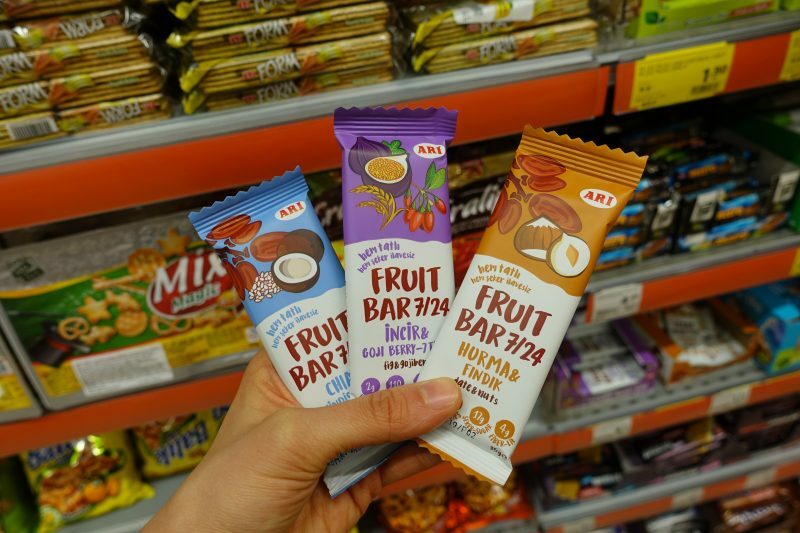 ), an amazing selection of healthy bars! Unlike most health bars, these are inexpensive and made in Turkey. 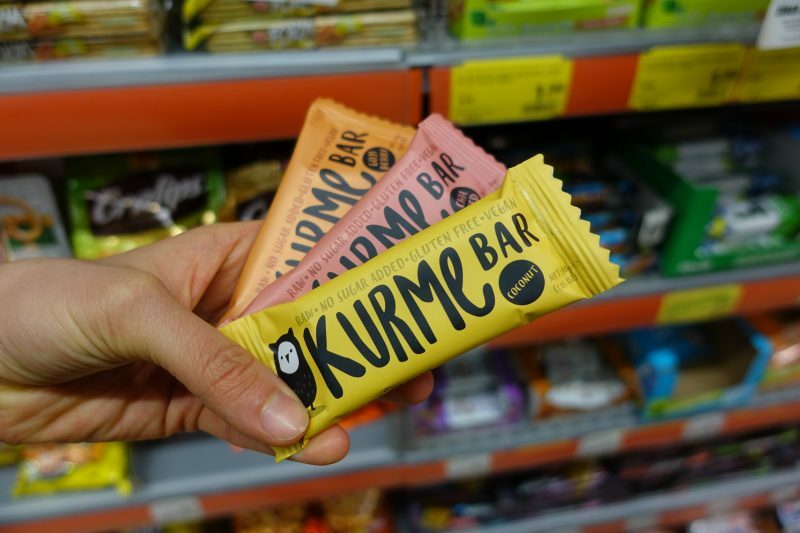 A Kurme bar is 2.70 TL and a Fruit Bar 7/24 is 2.25 TL. I ended up grabbing a whole bunch for my flight and highly recommend checking out this gem for some locally made bars. There is of course more! Other worthy mentions are Galata Kitchen and Mado (they have Mulberry, Coconut Milk, Hazelnut Milk and Bitter Chocolate ice cream). While both places were on my list I didn’t manage to visit them. I must say that Istanbul’s food scene, really took me by surprise. I simply wasn’t expecting it to be so vegan-friendly. There are of course heaps of Traditional Turkish dishes that are unintentionally vegan, so many in fact that I couldn’t have possibly tasted them all. As always, make sure to double check if what you think is vegan is indeed so and have fun eating it all! Let me know what your favorite dishes and restaurants are. I’d love to add them to my list for next time I visit Istanbul! 🙂 I only got to spend 6 nights there and loved it so much, I can’t wait to go back. Istanbul truly is a magical place! Congratulaciones for your blog! I really love your posts….specially your vegan food guides,very hepful! You are inspiring me to change some things in my life. Enjoy your travels and please keep posting!